The OpenStack Summit kicks off in less than five weeks and 12 deserving organizations have been nominated to be recognized during the opening keynotes. These organizations are competing within four categories—enterprise, telecom, research / government and public cloud service providers— to win the Superuser Award that will be presented by AT&T, the most recent winner from the OpenStack Summit Austin last April. For this cycle, the community (that means you!) will review the candidates before the Superuser editorial advisors select the finalists and ultimate winner. There will be one finalist per category to be recognized during the OpenStack Summit Barcelona keynotes and the winner will be recognized on stage. Check out the nominations below and click through to see each organization’s full nomination. Then, rate the nominees with this survey to select the nominees that you think should be recognized at the OpenStack Summit Barcelona. You have until Friday, September 30 at 11:59 p.m. PT to rate them. Mercadolibre has recently implemented its own hybrid cloud, multivendor PaaS based on Docker containers within VMs, and the platform is 100 percent in production, with over 300 active applications, self-healing and auto-scaling over OpenStack and two public clouds. City Network focuses on helping regulated companies, mainly in the financial and healthcare industries, with their digital transformation and cloud adoption. By building completely separated cloud services compliant with regulations such as ISO 9001, 27001, 27015, 27018, Basel, Solvency and HIPAA, City Network allows these industries to be truly agile. The Cloudwatt team has contributed code upstream in nearly all the Openstack core modules, especially Nova, Horizon and Tempest. Cloudwatt infrastructures are deployed on two data centers in France with more than 400 hypervisors, 10,000 VMs and 400 TiB of object storage. DataCentred’s public cloud has around 9,000 virtual cores and 8TB of RAM and its team typically operates at 75 percent capacity as the platform scales. It has a global user base with customers distributed among Israel, New Zealand, the U.S. and Asia, and some of its largest customers are U.K. government departments including HMRC, the tax office. Internap’s OpenStack based public cloud and bare metal offering is globally available in seven data centers worldwide. The combined footprint is 17,760 vCPU of compute, 1,756 of bare metal servers and over 1PB of Swift storage. Its infrastructure-as-a-service (IaaS) based on OpenStack currently predominantly powers customer production workloads in gaming, ad tech and web hosting. OVH runs large OpenStack infrastructures: Its main platform, launched in 2015, manages thousands of compute nodes distributed within six different regions. It currently has more than 100,000 instances running in production, and 530,000 instances are spawned per month. The OpenTelekomCloud public cloud environment contains more than 2,000 servers (compute and storage nodes) in one region and two availability zones. In production since March 2016, the public cloud has hundreds of customers and recently the web presence of a public broadcasting station was using the OpenTelekomCloud during a state election in Germany. UKCloud is operating across two sites, each with two isolated OpenStack deployments to meet its customers varying levels of security – in essence, this gives UKCloud four separate production grade OpenStack deployments, each of which is currently built to handle around 1,500 instances. VEXXHOST has thousands of customers all over the world who host tens of thousands of instances across VEXXHOST’s OpenStack infrastructure. In a single day, its customers run hundreds of deployments, including big data customers that leverage OpenStack as well as CI/CD customers. The INDIGO-DataCloud Consortium has made efforts to support TOSCA in both OpenStack and other cloud management frameworks by contributing code for the TOSCA parser and Heat translator projects, and it’s expected that the usage of this open standard will ease interoperability. UFCG’s team has contributed 109,000 lines of code and 4,300 reviews to OpenStack over the last three years. Its members have also contributed to large blueprints, such as hierarchical multi-tenancy and cross-project Keystone v3 adoption. Based on OpenStack, China Mobile’s application release cycle has been shortened from half a year to a month, and its big data prediction platform has increased the success rate from around 3 percent before to 15-20 percent now. 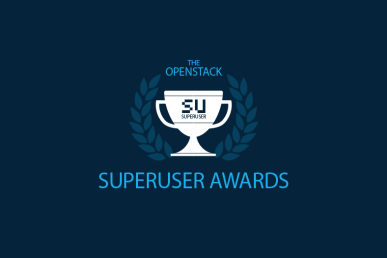 You can rate the candidates with this survey until Friday, September 30 at 11:59 p.m. AT&T won the fourth edition of the Superuser Awards at the Austin Summit, joining CERN, Comcast and NTT Group who were the winners at the Paris, Vancouver and Tokyo OpenStack Summits respectively.